The University of Wyoming Department of Music’s Faculty Recital Series continues Saturday, April 2, with a performance by James Przygocki, UW professor of music, and guest artist Diego Caetano, instructor of piano at Casper College. The free public concert is scheduled at 7:30 p.m. in the Buchanan Center for the Performing Arts recital hall. “The French Influence: Romantic Music for Viola and Piano” will feature modern works for viola and piano by French-Belgian violinist Henri Vieuxtemps and English composer and violist Rebecca Clarke. Przygocki conducts the UW Chamber Orchestra and teaches classes in viola, violin and music education. 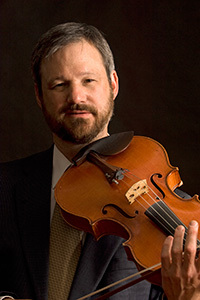 He also is the Cheyenne Symphony Orchestra’s principal violist. In the summer, he is a faculty member at the Indiana University Summer String Academy and the Rocky Ridge Music Center in Estes Park, Colo. Guest artist and UW graduate Caetano is a native of Brazil. He teaches piano at Casper College and Vibes School of Performing Arts, where he teaches applied piano and group piano. He received his doctorate from the University of Colorado at Boulder, his master’s degree from UW and his undergraduate degree from Universidade Federal de Goiás in Brazil.